Crossreactivity: Predicted species reactivity based on epitope sequence homology: rhesus macaque, chimpanzee, horse, arctic fox, dog, opossum, ferret. Scientific Background: Dopamine is the predominant catecholamine neurotransmitter in the mammalian brain, where it regulates locomotor, emotional, memory, and dietary intake functions, as well as peripheral roles such as hormone secretion and renal function. Dopamine receptors (D1-D5) are members of the seven transmembrane domain containing GPCR family, and are the target of several anti-psychosis and anti-Parkinsonian drugs. The D2, D3, and D4 receptors signal via coupling of Gi/Go alpha G-protein subunits to inhibit adenylyl cyclase activity and modulate cellular potassium and calcium ion channel conductance. Expression of the D2 receptor is found primarily in the brain (striatum, olfactory tubercle, and nucleus accumbens) and in the anterior and intermediate lobes of the pituitary. Immunohistochemistry analysis: Fluorescent confocal photomicrograph of rat cerebral cortex. 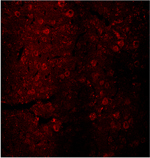 Neurons are labeled with Dopamine Receptor (D2) pAb in conjunction with Cy3 conjugated rabbit IgG antibody (H+L). 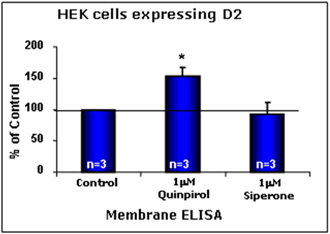 Cellular ELISA: HEK293 cells expressing dopamine receptor (D2) were treated with indicated concentrations of agonist (Quinpirol) and antagonist (Siperone) and probed with Dopamine Receptor (D2) pAb (1:1000 of a stock solution of 1μg/μL) by cellular ELISA. Data from vehicle treated cells were taken as 100%. Results are the mean ±SEM (n=3). Western blot analysis: MW marker (1) and 10µg of rat heart membrane extract (2) probed with Dopamine Receptor (D2) pAb at 4.0µg/ml.